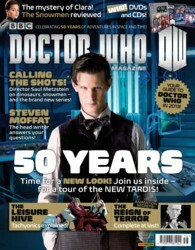 AlienEntertainmentStore.com: Doctor Who Magazine Issue #456 (Feb 2013) - 50 Years - New Look for the Magazine! Doctor Who Magazine Issue #456 (Feb 2013) - 50 Years - New Look for the Magazine! There was a lot of going forward, and a lot of harking back. Questions that must never be answered...? Doctor Who's showrunner and head writer Steven Moffat provides cool answers to burning questions from DWM readers in his new regular column. Revolutionary Animation: The First Doctor adventure The Reign of Terror is released on DVD this month, with brand new animation to bridge the gap left by its two missing episodes. DWM investigates how this remarkable reconstruction was achieved, with exclusive notes and images from the team that created it. An Ace Year: It was the year that saw Haemovores and Husks, the Brigadier and the Master and the Doctor become Merlin... and it would be the last regular series of Doctor Who for nearly 16 years! DWM takes a nostalgic look at the Seventh Doctor's final TV adventures as Countdown to 50 continues with a look at 1989. Sarah Jane Investigates: The Time Team takes a sideways step to look at The Sarah Jane Adventures, the popular CBBC spin-off from Doctor Who starring Elisabeth Sladen as the investigative journalist on the look out for extra-terrestrials. Comic Strip: The Doctor is on the trail of stolen goods � and gets the shock of his life! � in Hunters of the Burning Stone, the brand new comic strip by Scott Gray, and illustrated by Martin Geraghty. Wotcha! The enigmatic Watcher recalls the golden years of Radio Times listings, challenges readers with The Six Faces of Delusion and champions another Supporting Artist of the Month in Wotcha! All the latest official news, the latest DVDs, books and CDs reviewed, a prize-winning crossword and competitions and much, much more! See below for recent backlist issues you may have missed! We carry the largest selection of backlist Doctor Who Magazines in the Galaxy!